The 50A55-743 is an automatic gas interrupted ignition control that employs a microprocessor to continually monitor, analyze, and control the proper operation of the gas burner, inducer, and fan. signals interpreted during continual surveillance of the thermostat and flame sensing element initiate automatic ignition of the burner, sensing of the flame, and system shutoff during normal operation. these controls incorporate system fault analysis for quick gas flow shutoff , coupled with automatic ignition retry upon sensing a fault correction. 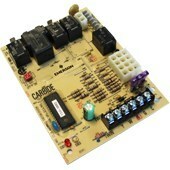 it is designed as a replacement for the following controls.